When decorating your home, not only do you want everything to look aesthetically pleasing, but you want it to also be functional. With Cadillac Window Fashions, we provide the best of both worlds by offering drapery that is both beautiful and practical. Drapery is a timeless look that has proven time and time again to give off a luxurious look and feel to your home at an affordable price. Think that draping may be outdated or you won’t find a style you like? Keep reading and by the end of this article you will be convinced otherwise! We offer hundreds of different styles, fabrics, colours and designs to match any look you may be going for. Just looking for a plain fabric to block out light? Or maybe you want a colourful pattern to spruce up your room? By choosing drapes, you are automatically guaranteed an elegant look that everyone will be jealous of, no matter the cause. In addition, curtains are not exclusive to covering windows. You can use them to cover glass doors or even walls to add a unique, refined look to any room. Lastly, Cadillac Window Fashions works collaboratively with you by visiting you at your home to provide a free quote, create a custom design, and provide installation. We work with you from start to finish ensuring that your overall vision comes to life. This is because we want you to wake up every morning looking forward to opening your curtains and starting each new day. Before purchasing drapery for your home, there are four things you must consider in order to choose the design that will look beautiful in your home and will meet all of your needs. These four considerations include knowing how you want the blinds to function, how to make them compliment your space, the dimensions you need, and whether you should use new or existing hardware. Drapes serve a number of different functions so deciding how you will be using them is the first step, as each provides different options. For example, are you looking into purchasing blinds to create privacy? Or maybe you want to block light from entering your home? Lastly, you might just want to insulate your home and reduce heat loss? No matter what you are interested in achieving, with Cadillac Window Fashion, we can bring your vision to life. Not only do you want your drapes to work properly and comply with their overall functionality, but they also must look nice and match with all of the décor already in your space. By meeting with the Cadillac Window Fashions team, we will get a comprehensive understanding of the colours of the walls and furniture and will be able to help you pick the perfect look, whether that is more traditional or modern. 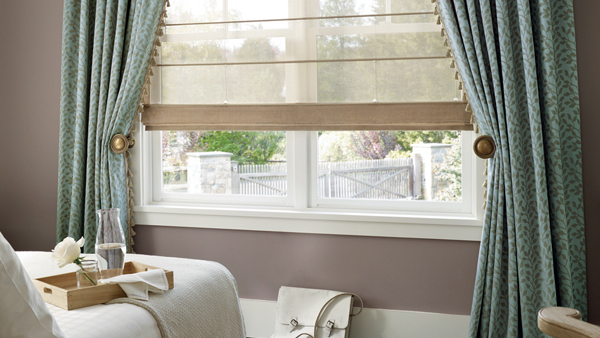 Determining the proper length and width is essential in ensuring that your drapes look and work properly. Having them too long and dragging on the floor not only creates a hazard, but it also creates a rather sloppy look, something drapes should not be doing. In addition, choosing the right fabric will ultimately determine what kind of a look you are going for. Depending on the type of fabric used, the drapes can be as sheer or opaque as you would like. Lastly, if you are sprucing up your place and just replacing old drapes, your new ones can be installed right onto your current curtain hardware. If you are venturing out and trying something new, then collaboratively, we can choose the type of hardware you desire and have our team install it at no additional charge! If you are in the market for curtains or drapes in Toronto, Mississauga, Barrie, or the GTA, Cadillac Window Fashions wants to ease the process by helping you every step of the way, from designing the perfect look all the way up to installation. We strive to provide an optimal customer service experience that will leave you wanting to redecorate every other room in your house. Contact us today for a free quote!